Chris Brown turned himself in on Sunday after he was sought by police for beating a woman. The incident happened at 12:30 a.m. Sunday morning after a pre-Grammy dinner. Witnesses say Brown and an unidentified woman were in a car in Hancock Park when they started arguing. Brown stopped the car and both got out. The argument continued to the point where Brown physically assaulted her. The victim called 911 but by the time police arrived, Chris had left. 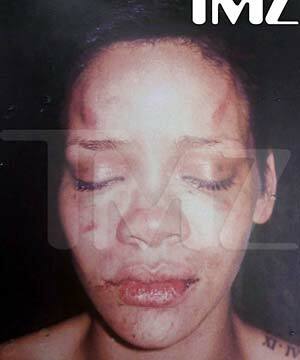 The woman, suspected to be Rihanna, suffered visible injuries and identified Chris as her attacker. Both Chris Brown and Rihanna pulled out of their performances at the Grammys Sunday night. Current reports indicate Rihanna is cooperating with police after the DA told them to gather more evidence. According to a source, the two were driving through the Hancock Park neighborhood when they got into an argument. Chris pulled his Lamborghini over and that’s when Rihanna took the keys and threw it out the window. An already pissed off Brown went to find it. When he came back, he started to choke Rihanna and said, “I’m going to kill you.” She lost consciousness soon after, but when she came to, Chris was gone. According to the source, her right eye was blackened and badly swollen and she had hand prints on her arms. The responding officers were so concerned about her, they drove Rihanna to the hospital in their squad car instead of waiting for an ambulance. Rihanna was born in Saint Michael, Barbados, to Ronald and Monica Fenty. She has two younger brothers, Rorrey and Rajad Fenty. Her mother, a native of Guyana, is Afro-Guyanese and her father is Afro-Barbadian and caucasian. Rihanna attended Charles F. Broome Memorial School, a primary school in Barbados, and then the Combermere School, where she formed a musical trio with two of her classmates at the age of fifteen. In 2004, she won the Miss Combermere Beauty Pageant. She was an army cadet in a sub-military programme that trained with the military of Barbados and Shontelle was her drill sergeant. In 2003, friends introduced Rihanna and her two bandmates to record producer Evan Rogers, who was vacationing in Barbados with his wife. The group auditioned for Rogers, who said that "the minute Rihanna walked into the room, it was like the other two girls didn't exist." She eventually moved to Connecticut to live with Rogers and his wife. Rogers, along with his partner, Carl Sturken, helped Rihanna record material in the U.S. to send to various recording companies. Rihanna's demo made its way to Def Jam, which invited her to audition for the label's then-president, Jay-Z, who quickly signed her. [wikipedia.org] Chris Brown Beats Rihanna You should create your own MySpace Layouts like me by using nUCLEArcENTURy.COM's MySpace Profile Editor!